When you hear word that a game is retro-inspired, what's the first thing that comes to mind? Pixelated homages to platformers long past? The type of title that takes stalwart mechanics and filters them through decades of proven formulas to make them palatable to today's gamer? Something that straddles the line between tasteful tribute and blatant rip-off? Assumptions are easily made, but sometimes you never know what you're truly going to get. Vektor Wars by Super Icon takes 'retro-inspired' in a different direction. It's a first-person arcade shooter with more similarities to Robotron: 2084 than, say, Doom. It's dripping with a love for neon and polygons, of obnoxiously loud and thrumming techno music with a dash 80s-infused death robots. 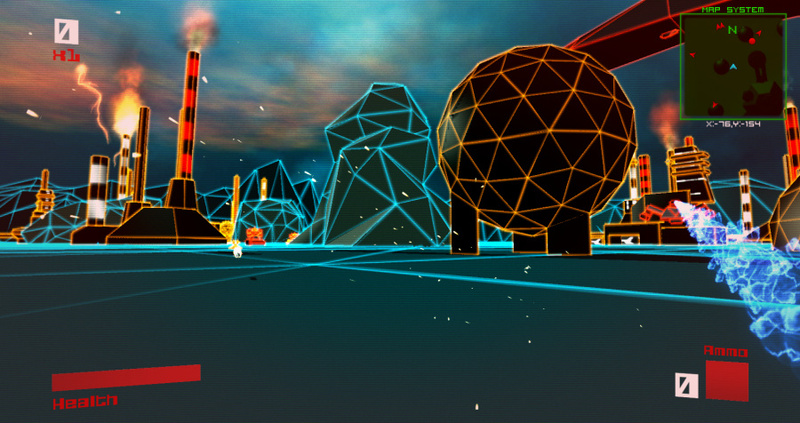 It is a game that looks like what we all hoped the future would be in that decadent decade. The goal of the majority of Vector Wars is simple: survive. Wave after wave of simply animated machines will randomly generate throughout the large maps, all homing in on your position and all wanting you to meet your demise. There are approximations of everything from tanks to drones to foot soldiers, all with little to no A.I. pushing them ever forward towards you. There isn't much of a tactical bent to it at all; its run, shoot and hopefully live. It is an arcade game in spirit if not in format. All that robot blasting would be boring if you didn't have an arsenal to shake things up. Much like a tried-and-true first-person shooter your ordnance is familiar, but comforting in its fire power. Things like mini-guns, rocket launchers and shotguns pad your loadout, each lasting for a short while before disappearing as you pepper your foes with ammunition. Strategy doesn't stray far beyond things like using shotguns up close or strafing at all times, but with an undeterred army of mecha chasing after you, thinking terribly hard is probably not in your best interest. Vector Wars shakes things up by adding a bevy of play modes to accompany the dependable story mode. Arcade mode gives you three lives and pushes you to see how long you can survive an interminable wave of bots. Deadline, on the other hand, gives you five minutes to create as much havoc as you possible can. Sequence takes Deadline one step further by giving you two minutes in each zone for a different kind of chase to the top of the leaderboards. Lastly there's Survival, which tasks you with going as far as you can on one life with the stipulation that you have to destroy a robot every thirty seconds. Vektor Wars is built for short play sessions, so anyone hoping for more depth might be disappointed. 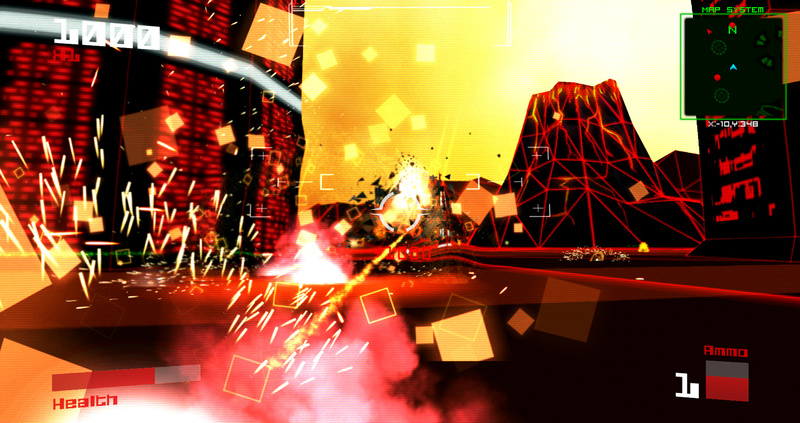 Not everything in Vektor Wars is neon sunshine and rainbows. It suffers from stuttering every now and again, regardless of what's on screen. Luckily precision isn't key in winning in this game, but it's noticeable. Likewise, big explosions are brought to big effect when you down certain enemy craft and the screen shake can be somewhat disorienting. This on the other hand can cost you a match as the simple graphics can blend together, and by the time you get your bearings the enemy will have come down on you and you're done. Again, nothing game breaking but worth mentioning. I do like Tron so may check this out. 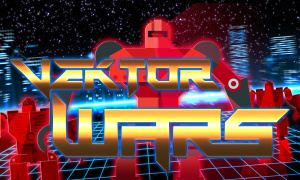 Vektor Wars reminds me a lot of Battlezone, which was a great arcade tank game — perfect for short sessions. @GrailUK if you are on the mobile site and reading a review you have to click on "overview" in the orange box at the top and scroll down the info. The price is in there. Love the art. If it's NA I'll buy tonight. Also available on Steam. What does the Wii U version do with the GamePad? But you left out the most important part! How does it control? Does it use dual analog, some sort of analog and gyro fusion, or classic PC FPS controls (like "Wolfenstein 3D," "Doom," or the basic control scheme in "Metroid Prime: Blast Ball"). Does it support a Wiimote + Nunchuck control scheme? What is the general quality of the supported control schemes and the gameplay in general? Yeah controls are important. If it's like Battlezone where the Y-axis doesn't matter then I'm okay with dual stick, but if I need to be looking up, I can always get it on Steam for Mac and use a mouse and keyboard. I had an urge to buy this last night, but then dusted off and played ZombiU instead and was able to scratch that FPS itch... got further than I ever did too! @Chaos_Monkey Thanks for the review link. I really like the idea of having the map on the GamePad screen, though always having it on the HUD seems kinda pointless after that. Also, I totally forgot to ask about control---I'd assumed that gyro control would have been mentioned as a GamePad feature if it were there. If the game handles pretty much like any ol' modern FPS, then having gyro control would be a must. Being forced to pretend the right analog is a mouse has always been a deal-breaker for me. Sadly, I don't think that gyro control is part of the Vektor Wars control scheme. 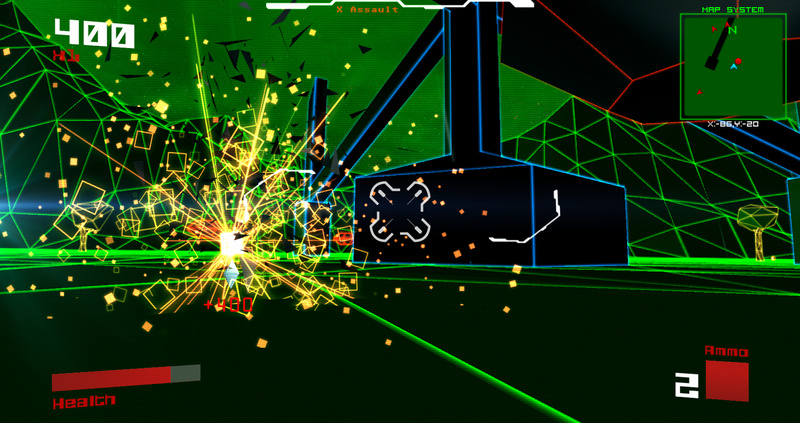 This game is a dual-stick shooter with a FPS perspective. You're right--having the map on the HUD when you have it on your GamePad is pointless, but I guess the original programmers didn't bother to do the programming to remove the HUD map display when converting this title over for the Wii U. I also tried to play this game with a Wiimote and nunchuk combo, but that didn't work. This leaves players with either the GamePad or the Wii U Pro Controller. That said, I still think that this is a fun retro FPS that's worth its low price tag. Damn, this seems like it'd be really good, too, especially considering the price. @Chaos_Monkey Thank you for informing us of basic information that should've been in the review. Dual analog equals no buy from me. Why can't these developers remember that the Wiimote is still compatible with the Wii U?! Fingers crossed they'll add gyro. Unless Apple releases an updated Mac Mini. I don't know if I can run this so Wii U or bust, I guess!